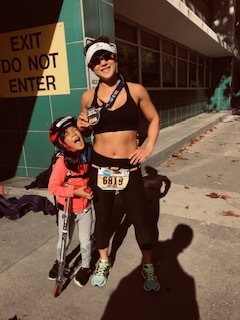 CONGRATS to all our runners at #cim California International Marathon, including our founder Victoria Liu for completing her 1st marathon! Course PR by @runsweatandvino WAY TO GO rock ⭐️ ! Shout out to Nancy for winning her AG at the tender age of 66 with smokin 💨 time of 24:45 at the Bah Humbug 5k! You can see the full story on our facebook page: https://www.facebook.com/pg/ironhorseptpilates or our instagram page @ironhorsept. We take Recovery pretty seriously here at Ironhorse PT and Pilates so here are some quick and easy tips on how to recover so you can set yourself up for a successful race season! 1) Sleep More: Get at least 7-9 hours of sleep (or even more!) to recover and regenerate tissues that have undergone some microtrauma. Running, for example transmits fores 3-5x your body weight to your bones, muscles and tendons, etc. with every step you take. There's roughly 60,000 steps in a 26.2 mile marathon! That's a lot of work for your body to handle and in order for it to bounce back stronger, you'll need to SLEEP! That's where all the magic happens. It's not actually happening while you are training, it's when you are resting. 2) Drink More: You'll need to replenish fluids post-race for your body's internal plumbing to work properly. This is especially important if you suffered from any GI distress during your race. An easy way to determine how much to replenish is to weigh yourself before and after your event and drink 16 oz. for every lb. you lose. We like rehydrating with bone broth or water with an electrolyte tablet such as Nuun. 3)Compression: The research goes back and forth on this but in our experience, athletes generally feel better wearing compression tights/socks. Clinically, our patients with tendinitis generally experience less pain when active muscle contraction is coupled with compression. Compression is partly why the Cho-pat brace is effective in patients with patellar tendinitis (pain under the kneecap or "jumper's knee")- it reduces the internal tension generated by the tendon. We also love using our Normatech compression boots to boost recovery! It applies a pulsing and sequential compression pattern from your feet to your thighs to mobilize fluids and mimics the kneading and stroking of massage. 4) Perform Light Activity: It may be tempting to just be completely sedentary and avoid moving at all but your body is like "concrete waiting to harden". Doing some light mobility exercises, diaphragmatic breathing, or easy walking will bring blood flow to micro-traumatized tissues and help ease some of the stiffness you undoubtedly feel post race/event. 5) Massage/ART (active release technique): Post-race soft tissue work shouldn't be aggressive or painful. Instead, it should help create an optimal environment for healing and recovery. The right type of tissue work can give athletes some pain relief, improve circulation/blood flow and help with relaxation. **Here's an infographic to illustrate the ideas: Feel free to reach out if you need some help recovering from your race or event by giving us a call at 925-222-5446 or send us an email: admin@ironhorsept.com.